Tonight is the night. The Union take on Houston Dynamo in the U.S. Open Cup final. It will be the Union’s third shot at the cup in five years. Find all the details on the match and how to watch here. More on the Cup final from Taylor Twellman, Adam Cann, the Philadelphia Inquirer, ProSoccer USA, DelCo Times, MLS. After scoring his brace to beat Sporting Kansas City, Jay Simpson was named MLS’s Player of the Week. Union broadcaster and long time American play-by-play analyst J.P. Dellacamera is (finally) going to the National Hall of Fame. Philadelphia is creating a youth movement. After a massive USL rebranding (more on that below), Bethlehem Steel will play in USL’s top tier, the USL Championship. The Union’s PDL affiliate, Reading United, will play in USL’s bottom tier, League 2. 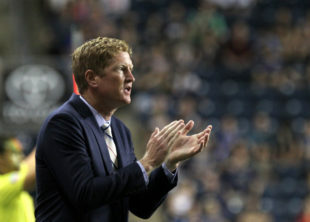 Vancouver Whitecaps fired their longtime coach Carl Robinson. The decision had apparently been made some time ago. Atlanta United hired the cap-master from the Atlanta Falcons to handle player contracts. It will be interesting to see how this affects their spending habits. The USL as we now think of it will become the “USL Championship”. The top tier. There isn’t any promotion/relegation yet, but it looks as if the USL is setting itself up for the future possibility. Amnesty International has reported that migrant workers are still being exploited in preparation of the 2022 World Cup. Berlusconi is buying another Italian team. This Canadian team keeps getting better and better. FC Barcelona teenager Ballou Tabla has committed to playing for Canada instead of the Ivory Coast. In a huge upset, Frank Lampard and Derby County knocked Manchester United out of the League Cup. As Ryan says, yesterday, the United Soccer League announced a rebranding. “DOES THE NEW STRUCTURE MEAN THERE WILL BE PROMOTION AND RELEGATION WITHIN THE LEAGUES? What if Major League Soccer has a silent secret ownership stake in the United Soccer League? I think I noticed a hint at that elsewhere and much earlier in a tangential reference I cannot find. Down the road there may be limited U. S. pro-rel, and MLS may be in on creating it. Changing the expectations of a nation’s sporting culture would be a long, tricky, risky process. It would make sense to begin it in a limited way, between two minor leagues only. Here’s the link to the Q & A article on the USL website. USL has already stated that they are working towards pro/rel. These are the first steps towards that. They stated will see and maybe. Makes you wonder if Rochester and Richmond move down, why would they want to move back up? Best chance for pro/rel here is that MLS expands so much that it becomes possible for a tier 1 and tier 2 of some sort. It’s doubtful that you’ll see it link with USL because the buy in costs (at the MLS level) and market disparities are just too big to bridge with the smaller markets. I’d LOVE to see it, but unless the whole US soccer was introduced with that system in place in the first place back in the 70s/80s, or organically grown over the course of 150 years, it ain’t happening here in our lifetimes. The horse is too far out of the barn financially. Get out of here with that sort of economic logic, Dave! This. Talk of pro/rel is tiresome. It is never. Ever. Happening. For. MLS. And I’m not even convinced that it would be a good thing. But even if it would be a good thing, it’s moot, because it’s never happening. I learned a while ago to never ever believe someone who is certain never ever is never ever happening. Some of the most important words ever penned. I’m on the positivity/100% hope train this morning. Don’t let me down, Union. U.S. soccer is a funny thing, full of contradictions. MLS.com insists on calling draws ties, shuns the term football but the USL goes and lifts the division names whole cloth from the UK. I have no problem with this and think worrying about terms and labels is a remarkable waste of time. It’s just funny is all. If USL goes for Pro/Rel, I think it might really compete with MLS for eyeballs. That would be an attention getter. Funny how naive some may be ….to think USL may actually not have ulterior plans… of its own. Apples and Oranges its always been Apples and Oranges…. …and believe me, when it comes to this polarizing topic when over the course of time soccer grows to be the biggest sport in the land and an entire pyramid grows under or besides MLS… I will be an incorrigible geriatric. Do you really think having 2 competing leagues at the highest level is good for the sport? I can totally see a collaboration between the two, sort of a pseudo-merger if USL does indeed threaten MLS’ top tier monopoly, but competing leagues is not beneficial to either league nor the sport. Also, I think USL is genuinely interested in growing the game into smaller unestablished markets right now – a novel idea, but can a league with Bethlehem, Fresno, Reno, Harrisburg, and Tulsa really survive as the top league in America? If there is a Pro/Rel that is a legitimate possibility. But MLS & USL are both separate entities from each other and US Soccer – albeit governed by the latter – and both operate in a different way. If MLS was founded now it might be a different story, but their creation came at a time when they wanted to attract casual American sports fans, not true soccer fans. They can’t please everyone, as you mentioned there will always be both sides of the coin. I think USL is re-branding at a time when soccer is stable in this country so they can think about the best way to position themselves in the soccer market and promote the league to “true” soccer (see: football) fans. MLS, meanwhile, is still in a position where they want to grab more casual fans to help grow the game as a whole. Or at least that’s the way I see it. Pro/Rel would almost certainly attract more people to USL, and those “Euro-snobs” who keep clamoring for it in MLS would continue to bash the league. Until their favorite team drops to League 1 because, like the leagues in Europe, only the richest of teams will actually compete for wins and the rest will be fighting solely to stay in a league they can barely afford to compete in.